I would like to share a bit about what I have been reading lately. This may or may not develop into a regular feature of The Library Basement. There is something quite pleasing in discovering a new author whom you love reading and who already has an extensive (and growing) corpus. Thus I was pleased to meet Brandon Sanderson. He writes great literature in the fantasy genre. He was chosen to complete Robert Jordan's Wheel of Time series. He was Jeopardy champion Ken Jenning's college roommate. My reader can infer from this last detail that Sanderson is a Mormon. It seems that being a part of the LDS church has empowered some really great science fiction and fantasy. Do not forget that Orson Scott Card is a Mormon as well. Both Card and Sanderson conjure universes where in men have been elevated with godlike powers. I see a parallel between these stories and the LDS theology of the Celestial kingdom, wherein the faithful attain godhood. My analysis may be overblown, but I sure appreciate reading good stories by imaginative Mormons. 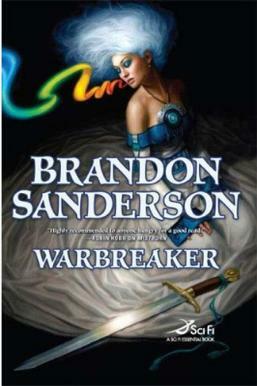 As for Warbreaker itself, I really enjoyed it. It is a mystery which studiously avoids too many twists. The fantasy elements engage the imagination and have an original feel. Sanderson has good pacing, and the 600+ pages in paperback did not feel overlong. Recommended. I fell a bit behind in my magazine reading heading into this month. I was able to finish Harper's June, Harper's July, and Scientific American June. That leaves me with two back issues of Biblical Archaeology Review and one more SciAm (with another round of monthlies on the way, of course). Of note this month was a good essay in Harper's June about a trip to the Chernobyl exclusion zone. Steve Featherstone tells one anecdote to highlight the paranoia of deadly radiation - imagine finding a burrowed tick after a day out in the hot zone. Yikes! I continue to find the puzzles in Harper's to be bewildering, though I do not expend any real effort on them. Maybe next month. My family was kind enough to give me another Brandon Sanderson novel to enjoy after seeing how much I liked the first one I read. Elantris is Sanderson's first novel, yet it is not too rough around the edges. I did notice some striking similarities with Warbreaker: a princess from a foreign land is sent by her father the king to fulfill a political marriage; people with extraordinary abilities are worshipped as gods; a few others. Yet there were sufficient differences that I found the similar premises to be quirky rather than repetitive. Recommended. I found myself advancing through it at a good clip, reading over 100 pages in an evening to finish it out. Two great novels from Sanderson, so I'll plan on reading his Mistborn trilogy. [ ]Zeitoun is a fantastic book. 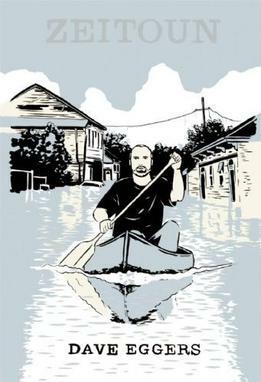 It is the true story of a man's quest through the chaos of Hurricane Katrina in New Orleans. Eggers' account is by turns heart-warming and outrageous. If you feel the need to read something to bolster your questioning of state power, this is your book. It is a quick and addicting read. I completed it in two days, including a final sitting of about 130 pages. What's great about this story is that it is an intensely personal account in the midst of the regional tragedy and national shame of Katrina. We all know the story as a whole - it is larger than life. But here the reader gets to hear a real account of what it was like on the inside, and sees some of what the news never found. You'll come to really care for the protagonist as he paddles through the flooded city in his second-hand canoe. More importantly, Zeitoun causes us to consider how society can be so fragile and confront how those who are tasked with creating order can instead foster chaos. Recommended. The premise of the Number of the Beast is one of science fiction's best: traversing multiple universes. Yet Heinlein takes such a golden opportunity and muddles it. In a book which is marketed as an exploration epic, half is spent in only one alternate universe, and the narrative is mostly comprised of contentious bickering among the protagonists. Moreover the characters are so smart, so skilled, so prepared, and so well-equipped that there is not any imaginable danger to them. This lends itself somewhat to a farce, but all the bitter arguing the reader is forced to suffer through nullifies any comedic value. I have about 100 pages left, and I'll probably finish it at some point, but I have laid it down in favor of better books for now. I could go on and on, but someone else already has. Do yourself a favor and skip The Number of the Beast. Do read The Moon is a Harsh Mistress and Stranger in a Strange Land, which represent Heinlein at his best. Not recommended.